ZIMBABWE – To an ordinary eye, this year’s edition of the 21st February Movement commemorations held at the iconic Great Zimbabwe Monuments just came and went, without any of the “prophesied” factional infighting rearing its ugly head. The running battles that were predicted by analysts beforehand did not happen; no one was heckled, as one paper had predicted, and the boycott which newspaper readers were alerted to ahead of the bash was not there as thousands thronged the ancient city, braving, in the process, contrasting extreme weather conditions of unbearable heat before midday and heavy rains afterwards. It appeared as if everything was calm across the floor. But everything was not as it seemed. It took a discerning eye and an alert ear to detect the subtle features that sold out the forged unity that was on public display throughout the event. Some of the speeches, however, were more to the point, while others needed to be read between the lines for one to get their meaning. While nothing of the much anticipated drama took place at the event, there were more than enough delicate features that, to a keen observer, did the loudest and clearest talking. The ruling party’s factional battles to outfox each other were so subtle and executed with such novelty that many missed the drama. 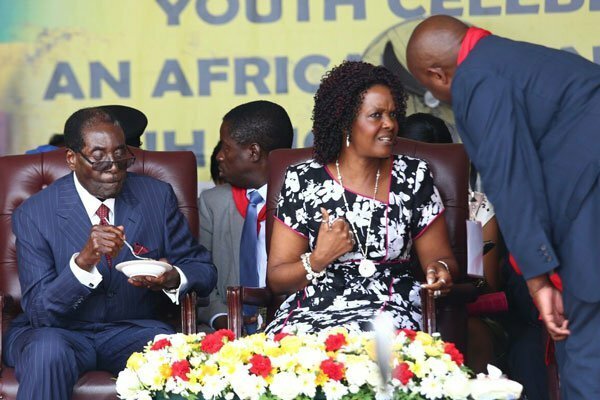 Hardly a week after President Robert Mugabe admonished the wrangling factions — namely Generation 40 (G40) and Team Lacoste — telling them to shut up and halt their fighting and work together, they were at each other’s throats at the ancient city. However, hard as they may have tried to demonstrate unity, their actions betrayed their posturing as cosmetic. And, judging by the warnings in the President’s keynote address, the party bigwigs might have not succeeded in their attempt to deceive him, for he openly repeated his warnings against the bitter wrangling. The first act of division presented itself just before the proceeding started. Perusing through the official programme, this reporter noticed that the one who was scheduled to give the welcome address was provincial chairman Ezra Chadzamira, who was suspended from the party by national political commissar, Saviour Kasukuwere. Masvingo province, being a Mnangagwa citadel, had defied the suspension and stood by their man, even as shown on the programme where he was to welcome guests to the host province. Chadzamira, along with the Midlands provincial chair, Kizito Chivamba and their Mashonaland East counterpart, Joel Biggie Matiza, were suspended by Kasukuwere on allegations of fanning factionalism in their provinces. Their case at the time was before the National Disciplinary Committee. Shockingly, when the time came for the provincial chairman to give his welcome remarks, it was an Amasa Nenjani — handpicked by Kasukuwere — who stood and spoke to a largely poker faced crowd. At this stage, if it were a soccer match, the scores would have stood: G40: 1, Team Lacoste: 0. G40 were in cruise control because the ZANU-PF Youth League political commissar, Innocent Hamandishe, was touted as their man. The Young Turks faction had its way, but the battle was still very much on as a terrific mind game began to unfold. Next on the podium was Hamandishe’s boss, Pupurai Togarepi — a Mnangagwa ally whose speech clearly showed that the camaraderie of the pest had long departed and might never return to the troubled ruling party. “Your Excellency, I feel ashamed as a youth leader that there are some devious characters who are abusing the social media to denigrate each other, even fellow Politburo members. They must go, and they must go now. There are some youths who insult leaders in all positions. Allow me President to dismiss them instantly from their positions,” he said, receiving applauds. Then after his address, Togarepi requested for more time than was originally allocated to him so that he could present to the President those he referred to as his friends who served prison terms with him during liberation war. This, many suggested, was a masterstroke of a decision by Team Lacoste as it was meant to remind the President of his friends of old, which friends G40 stands accused today of looking down upon. The faction has not had the warmest relations with the former freedom fighters in recent months. As they moved up the podium to shake hands with President Mugabe, often sharing hearty embraces, a narrator stood to give each and everyone’s brief profile. Of the seven, three were said to have received military training in Egypt along with Mnangagwa. President Mugabe would start his address by chanting “Pamberi nema war veterans (forward with war veterans)” in what could be read as a clear acknowledgement of the gesture. At this stage, matters were level: G40: 1, Team Lacoste: 1. The President’s address also seemed to play a delicate balancing act as he called for order, effectively keeping the score line level. He asked all Poliburo members at the high table to stand up, addressing them one by one and spelling out to everyone that their duties should complement each other. That done, then came probably the mother of all insinuations when President Mugabe opened his briefcase to fish out his prepared speech on his own, raising speculation that he could now no longer trust his officials who once gave him a wrong speech last year. The incident happened in October last year during the official opening of the third session of the Eighth Parliament of Zimbabwe when, instead of laying the legislative agenda, he was supplied with a speech he had made earlier during a state of the nation address. The wrong-speech debacle also caused speculation on his spokesman, George Charamba, who, in January this year, torched a storm by harassing G40 members. Some sections of the party have been calling for his demotion, but President Mugabe has so far ignored it. Charamba himself never took his seat in the VIP tent at Great Zimbabwe, as he usually does, but stood aloof at a distance, clutching a pile of books on his chest, only sneaking into the tent to escape the rains, returning to his secluded corner as soon as it stopped raining. Twice, Kasukuwere vacated his seat to chat with Charamba — probably to try and give the impression that everything was in order. With these observations, one can safely conclude that it is only a matter of time before fighting reignites once again.